The path to parenthood is not necessarily an easy one. Normally, the act of becoming a parent takes approximately nine months. Incredibly, this is the exact amount of time it took for our adoption process from beginning to end. Nine months. And 36 hours. After the home visits, fingerprinting, interviews, classes and tests, we finally sent our paperwork to the adoption agency. Two months later we received the call. A baby boy was available. Praising God for his blessings, we spent the next several weeks eagerly awaiting the call to travel. The phone finally rang and we had to leave the next day. Our baby was now two months old. I realized it was exactly nine months since we began the adoption paperwork. 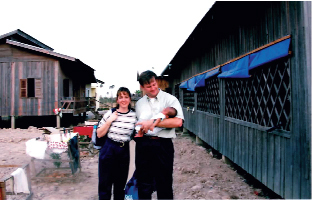 Getting to Cambodia the next day was no easy task. It may have been easier to get to the North Pole. We traveled 36 hours to arrive in Cambodia, with 24 hours spent in the air. It was the ultimate jet-lag. We had just unpacked our bags at the hotel when the adoption lady came to take us to the orphanage. I thought, “Are you kidding me? I’m exhausted! I’ve been on a plane with no sleep for 36 hours!” That’s when I realized I was well on my way to real parenthood. We approached a barn-like structure in the countryside with chickens and goats outside and laundry hanging on a line. This was the orphanage. No electricity. No running water. No cribs. Babies were laid naked on the floor or swinging in hammocks. Cambodian women were fanning the babies to keep mosquitoes away. A small refrigerator in the corner was running on car batteries. The 10 days spent in Cambodia were long and hot, but a blessing. We didn’t do the normal tourist things– we were in survival mode trying to manage a new baby, a new schedule and our exhaustion in a foreign third-world country. We did tour the killing fields to better understand the people and culture of Cambodia. Fast forward: We made it home traveling 36-hrs with a screaming baby, still exhausted, yet unbelievably happy. So happy, in fact, that we immediately filled out the paperwork for a baby girl and exactly 9 months and 3 weeks later, we were blessed to add our daughter to the family. I’ve been asked if I’m disappointed that I didn’t “have my own children.” I simply answer them “I DID have my own children.” Giving birth doesn’t make you a parent. To love a child unconditionally makes you a parent.